In order to breed and grow cattle in the heat and frequent droughts of Northern Queensland in Australia's hot tropical north several cattlemen set about crossing Zebu cattle (Bos indicus) with Shorthorn and Shorthorn/Devon. The breed contains approximately 50 percent Shorthorn and 50 percent Brahman bloodlines. It is spread throughout most states of Australia, although they are found mainly in Queensland. The breed is basically red in color, but can vary from a golden honey color to dark red. Droughtmasters are either polled or horned with the majority of cattle being polled. 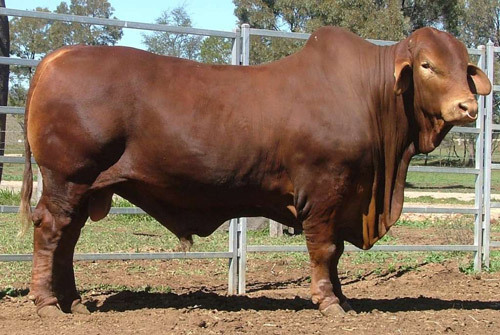 Their heat and tick tolerance, excellent fertility, ease of calving and quiet temperament give this breed a good reputation in Australia.